David Myers will be growing another brilliant moustache this month for a terrific cause. Three Bombers are taking part in this month’s Movember campaign and you can support them all. 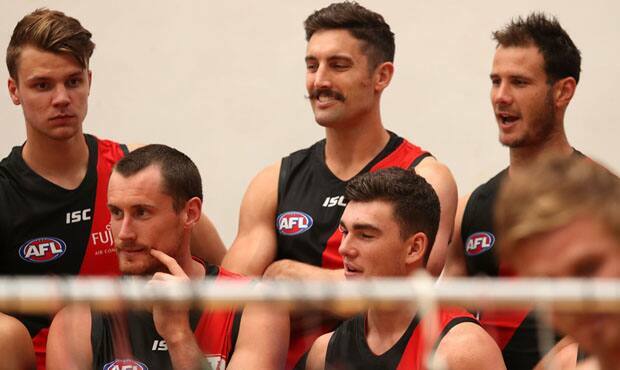 Midfielder David Myers – who sported a sensational moustache as an ambassador last year – was on hand to launch the festivities and will once again be taking part in the annual appeal, which raises awareness and funds to tackle prostate cancer, testicular cancer, men’s mental health and suicide. Myers, Tiger Kamdyn McIntosh, Giant Adam Tomlinson, Saint Josh Bruce and former Blue Sam Rowe were each shaved clean at Melbourne’s Federation Square for the launch, and Movember Foundation Australia Country Director Rachel Carr said their support is extremely valuable. “I’ve seen men in my life go through really tough times and heard first-hand the impact that men’s health issues such as prostate cancer, testicular cancer and suicide have on Aussie men,” Carr said. “AFL players have a unique set of challenges, and can suffer with performance anxiety, career transition, media and public scrutiny, injury and being away from their family and culture. Myers will be joined by teammates Adam Saad and Michael Hartley throughout the month, and you can follow the links below to contribute to the cause.